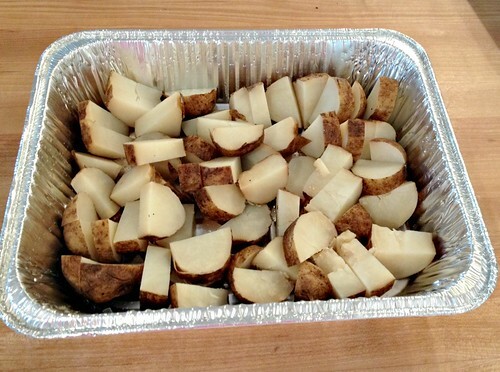 A couple weeks ago, we ended up with LOTS of extra baked potatoes after a party we had at our house. I was thinking of ways to potentially freeze them (my dad suggested shredding them for hashbrown potatoes, but I personally don’t love the texture of frozen potatoes… so I was hoping to come up with a better idea. Then I remembered that about a month ago, Dave’s mom made a potato dish with leftover baked potatoes… and it was really good. I didn’t have the recipe — but the concept was simple enough that it was fairly easy to recreate just by “winging it”. The results were really tasty — so tasty that I ended up making it 3 times in about 2 weeks! Anyway, since this recipe is SO simple and since you can essentially use whatever ingredients you have in the house or whatever ingredients your family likes, I figured it was another perfect recipe to share on the blog! If you’re looking for a great way to use up extra baked potatoes — or even if you’re just looking for a really yummy make-ahead potato dish for your next family gathering, this one is sure to please. 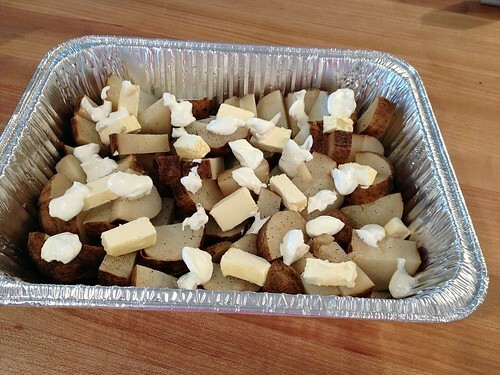 Of course, if you don’t have “leftover baked potatoes” you can always just bake your potatoes first, let them cool a bit, add the toppings, and then pop them back in the oven to melt the cheese and get nice and gooey. Oh, and I think this recipe would also work really well in a slowcooker. I’ve personally never tried it, but I’m almost positive that after 2-4 hours on low, it would be ooey-gooey and ready to go! 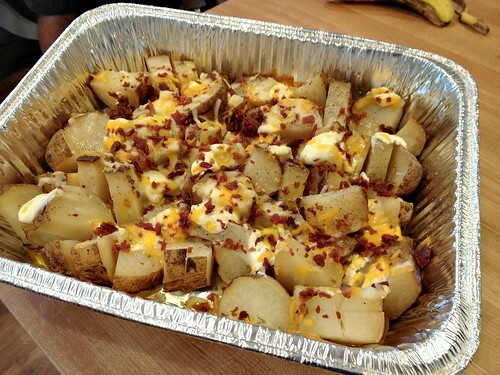 What are your favorite ways to use up extra potatoes? I love doing this with leftover mashed potatoes too! I call it twice baked potatoes. I will make a big pot and doctor it up so its easy to serve our family. 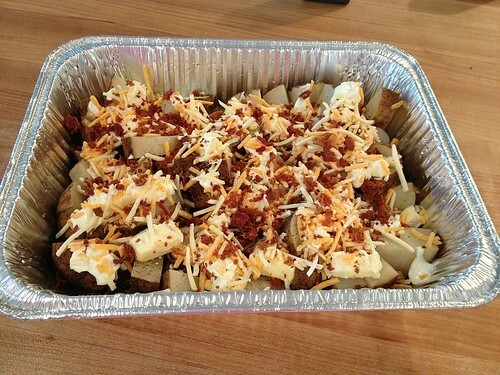 Saves time from everyone having to top their baked potatoes. They love it! 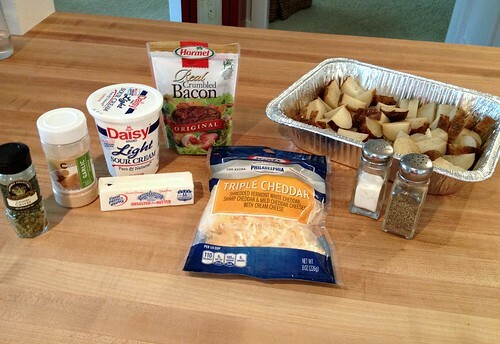 I used to make a dish similar to this when I was a poor student on a tight budget. 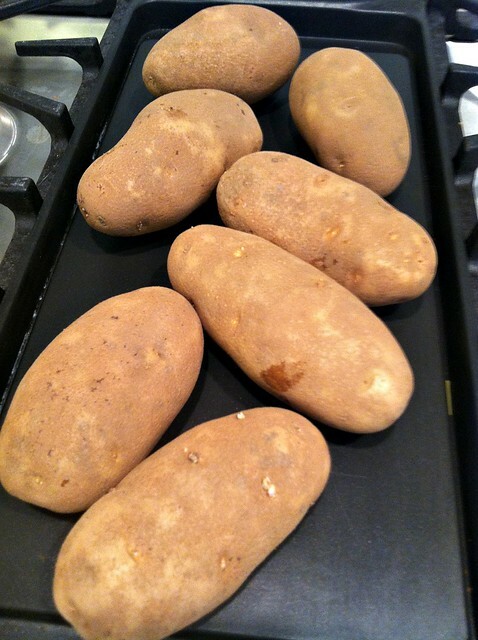 I cubed raw potatoes and put them in a baking dish and then topped them with a can of baked beans and grated cheese, then baked at 350 or so for about 40 minutes or until the potatoes were cooked. I considered it a whole meal in those days…not sure I’d recommend, but with the beans at least you get some protein! Just another idea. 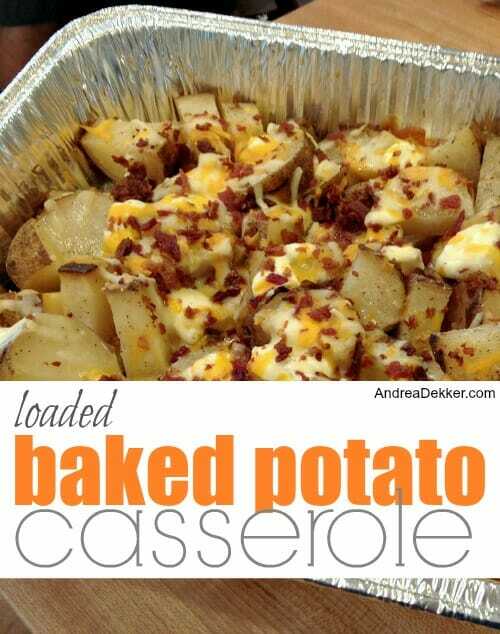 Obviously you could do it this way with pre-baked potatoes and add a can of beans on top.